Since it's officially fall, I thought I’d add some cozy layers and style to my master bathroom. Everyone wants a spa-like feel in their master bath, right? I had so much fun styling my bedroom with lovely linens from The Company Store, so when they asked if I would like to try my styling hand with some of their bathroom items, I happily accepted! Let’s dive into some of the pieces I chose! 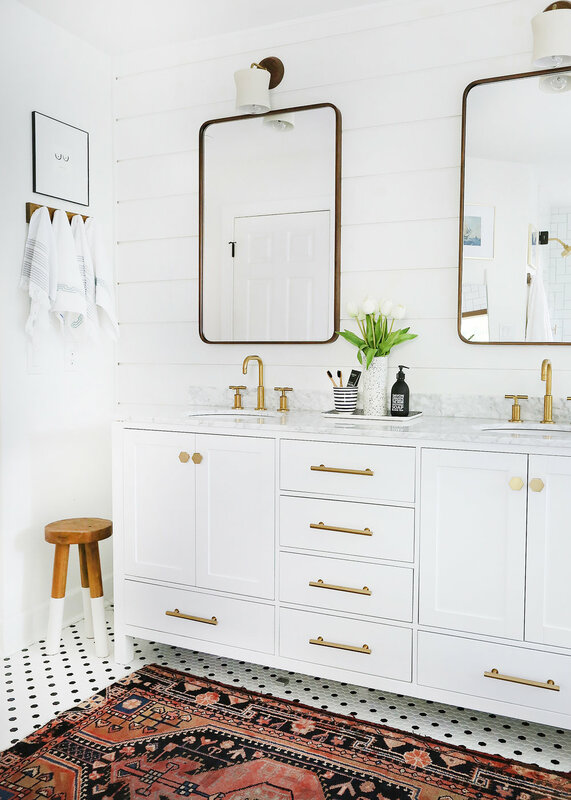 A bathroom isn’t typically thought of as one of the coziest spots in a home, but it should be! I mean you do get naked in there, right? Enter the softest and most cloud-like towels you have ever wrapped your body in! 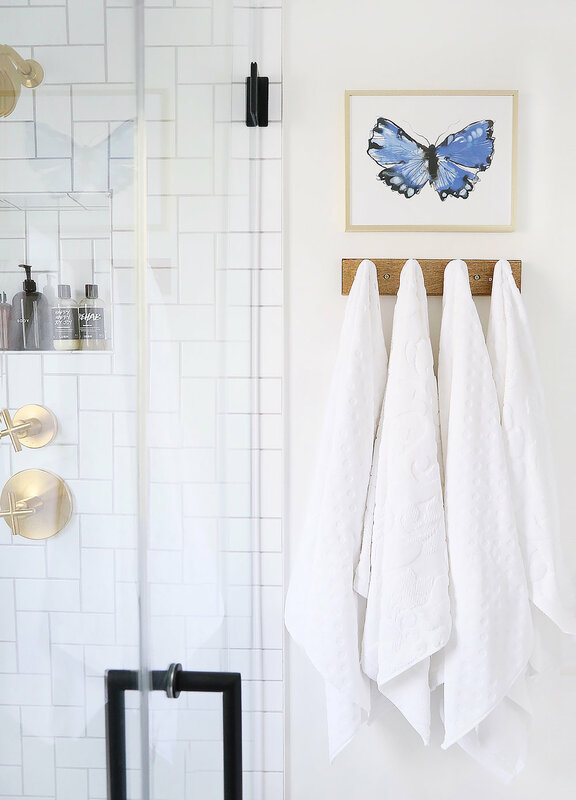 I thought I had good towels before, but the Dot Supima® and Fleur Supima® Luxury Bath Towels blow them out of the water! They are so soft, plush and absorbent, plus I love the classic look of crisp white and the subtle playfulness of the patterns. And speaking of cozy, that bathmat is the softest! 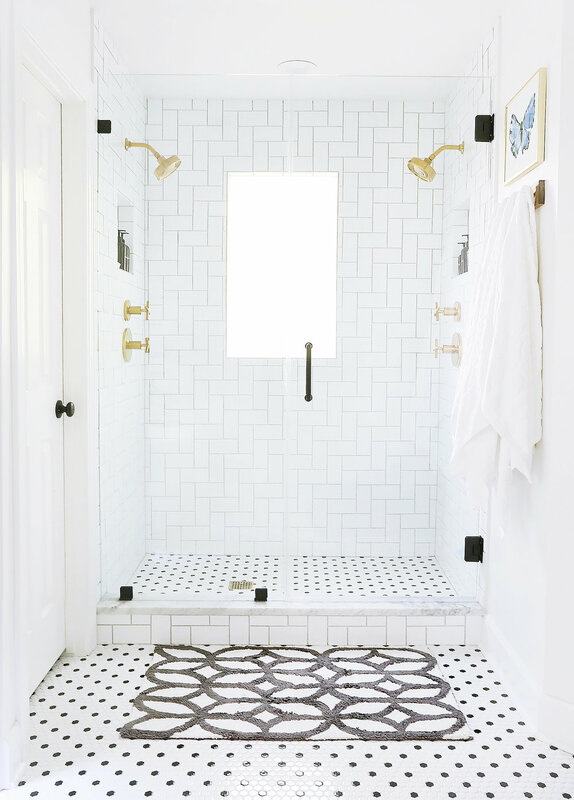 I chose the Trellis Bath Rug in neutral and I love that fun graphic pop against the tile and how it breaks up some of the white in the room. To bring more height to my bath tub area, I pulled in my bigger fiddle leaf and then made a little vase with some faux eucalyptus out of that cute little Carnival Stripe Lotion Pump on my bath caddy. I love a multi-purpose piece! Their Regal Embroidered hand towels are so soft and add a touch of color and pattern on that rattan stool. The whole look makes me want to lounge in the bath with a glass of wine and a good book! One of my favorite parts of styling is zeroing in on all the fun details! I’m drawn to modern/classic simplicity (like stripes!) and I love how the pieces from The Company Store® seamlessly blend with the rest of the decor. Instead of keeping the Carnival Stripes family of accessories together, I spread the love out over the entire bathroom so you can see everything tied together. Plus, stripes pretty much go with everything! My bathroom closet also got some love! I added marble contact paper (a whole post on that coming soon), accessorized with simple glass containers, all of those glorious towels, and added additional storage: from the distressed canvas storage bin (which holds so much), to these awesome upholstered laundry hampers in different shades of blue, to the Handwoven Chindi Storage Bins up on top. 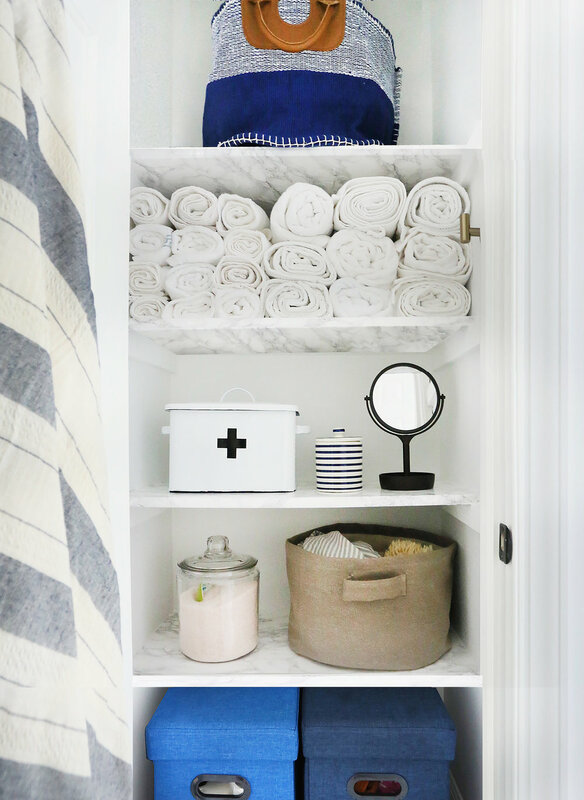 I got some stripes in there with my favorite little canisters—perfect for storing cotton pads and makeup sponges. I love how fresh and clean this all feels with pops of blue, white, black, with a neutral background, not to mention all the softness and texture from the linens. There is nothing better than a clean and organized bathroom to set the mind and body at ease.